He played the trumpet much like Chris Botti does today. The first notes of a number were clear and sharp, riveting attention. Then an up tempo swing into the melody with every note clear and perfect pitch. And there was the just right, light touch when needed. Often, the music was written and arranged by himself, for himself. But just as often, he arranged for and played along with the most famous singers of our time. >His name was Robert Farnon and he was destined to become one of the greatest composers and arrangers of the 20th Century. By age 20 he was leading an orchestra, jamming with Oscar Peterson and Dizzy Gallespie and had written his first symphony. 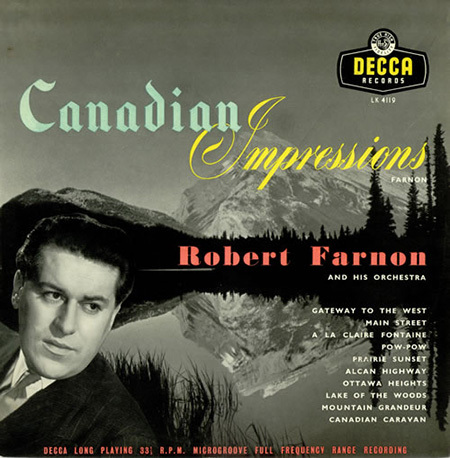 Farnon was born in Toronto in 1917 and died at his home on Guernsey Island in the English Channel in 2005, just short of his 88th birthday. Music was in his genes and his work covered seven decades. His family was and still is musical. His older sister kept it as a hobby but brother Brian played with Spike Jones and other big name bands. His other brother, Dennis, wrote music for “Mr. Magoo” cartoons and other films. Robert Farnon married twice and had five sons and two daughters. Several of them, as well as a grandson, are music professionals. As a teenager, Farnon was lead trumpet with Percy Faith’s CBC orchestra, and took the baton when Faith went to the United States. His trips to New York were usually by train for jam sessions at Minton’s night club. Gillespie said Farnon was his equal on the trumpet, which is saying something since Gillespie was one of the greatest names ever in jazz. They and Peterson were lifetime friends and always planned to make a recording together but never did. They got together in concerts and on television and some of this is archived. But their careers diverged. Peterson in many ways picked up where Art Tatum left off and preferred small groups, often only piano, percussion and base. Gillespie wrote and improvised in many stages of jazz including bebop, while Farnon created the sweet swing music that dominated in dance and concert halls during the war and into the 1960’s. For his longer works, he was finally recognized as one of the century’s greatest composers. Late in life, Farnon reflected on the differences of the two trumpeters and composers. He said Gillespie was a master innovator and both wrote and improvised some truly great jazz. But Farnon said his own work as an arranger made him write “music that melded, the kind announcers and DJs call ‘easy listening.’ Arranging seems to lead to music that is harmonious and I guess you would call it sweet. Which I must admit, I like.” He said he found bebop more for musicians then the general public. Farnon became known as the greatest in the world at the difficult art of arranging. And he wrote for everything from a four-piece combo to a full orchestra and in 1942 he had a second symphony playing across North America by the time he was 25. But for his Canadian audience he was first known in 1937 as a member of The Happy Gang. Their opening song had the lines “We’ve got entertainment for all of you folks. We hope you’ll like our music, our songs and our jokes.” Two million Canadians did just that for 22 years from 1937 to 1959, including kids who listened on their school radio while eating their brown bag lunches. In the darkest days of the war, the Gang sang “There’ll Always be an England,” every day. Farnon said most of the cast was confident on their instruments but nervous when they were talking in live skits and impromptu repartee. Those that adapted first tried to help the still nervous performers. This occasionally backfired, as when Eddie Allen joined the group as the lead singer. On an old record, a picture of The Gang has Farnon as pink cheeked with regular features, friendly smile, brown eyes and a full head of wavy dark brown hair. A record cover in his ‘80s has him more heavy-set and with receding grey hair. But with the same smile. Farnon wasn’t the only composer on the show, Pearl wrote songs, Bert Niosi, who played sax and clarinet, composed jazz numbers as did Bobby Gimby who later wrote ‘Ca-na-da’ for the nation’s centennial. Gimby replaced Farnon on trumpet when Farnon left for Europe. The war took him overseas in 1943, seldom to return, as he began conducting the Canadian Band of the Allied Expeditionary Forces alongside Glenn Miller with the Americans and George Melachrino with the British. The BBC handled the on-air performances, but many were unrecorded at air and army bases. Farnon listened a lot to North American music on short-wave radio and a lifetime compulsion developed. Most music was well written but not up to his standards. He would jot down better arrangements on any paper he could find and file them for later use. The names of his compositions have faded but the melodies are still familiar, played regularly on music programs half a century later. The compositions included: “Willie The Whistler”, “Portrait of a Flirt,” “Jumping Bean,” “Journey Into Melody,” “A Star Is Born” and “Westminster Waltz.” He also wrote scores for 40 films in Britain and America and they became standards on music radio. He became a “name” and over his long career composed hundreds of pieces of Light Music. His concert tours took him to many parts of Europe and of Canada as well. He worked briefly in the United States but liked to visit, not to stay. Notable works included “The Frontiersmen”, “Rhapsody For Violin and Orchestra”, “Prelude and Dance for Harmonica and Orchestra” (for harmonica virtuoso Tommy Reilly), and “Saxophone Tripartite”, which was commissioned by the Musicians’ Union for Canadian saxophonist Bob Burns. Toward the the end of the 1960s, rock competed with Light Music but Farnon was still much in demand. In 1962 Farnon was musical director for “The Road To Hong Kong” with Bing Crosby, Bob Hope, Dorothy Lamour and Joan Collins. “I killed off the series,” he said, “that’s what they told me.” They said that, because they had decided it would be the last of their Road films. Decca also recorded his own music and it influenced a generation of composers. Andre Previn called him the greatest living writer for strings and Henry Mancini and later John Williams of the Star Wars film scores said their work owed a lot to Farnon as both composer and arranger. He was music director not just for Crosby but for Tony Bennett, Frank Sinatra, Sarah Vaughan, José Carreras, Eileen Farrell, Lena Horne, Ray Ellington, Eddie Fisher and Carol Kidd along with many other singers. And he arranged for jazz groups led by many famous names, from George Shearing to Peter Appleyard. He arranged and conducted Frank Sinatra’s one and only British album “Great Songs From Great Britain”. Sinatra was an admirer and had Farnon send arrangements for some of his U.S. recordings. His arrangements and music direction for Tony Bennett began in 1968 and lasted for decades including records, a television series and many concerts including the 100th anniversary of Royal Albert Hall. Bennett said he was the greatest music director and arranger in the world. Sarah Vaughan had him arrange for her singing in Copenhagen with the Danish Svend Saaby Choir. In his ‘80s, he was still at it, working with the rising star trumpeter Wynton Marsalis, who said he was in awe of Farnon’s skills. Farnon won all the top British music awards such as the Ivor Novello four times including lifetime contribution to music. He was nominated several times for a Grammy, winning for best instrumental arrangement in 1995 for “Lament” on the J.J. Johnson album “Tangence”. 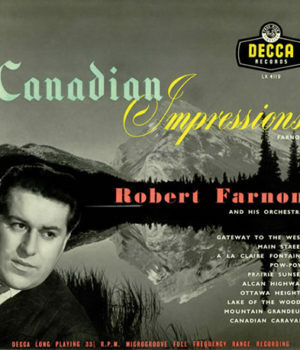 When he was 80 in 1997, there were concerts of his music in Britain and Canada on the BBC and CBC, with a special Tribute to Robert Farnon on BBC Radio-2. He was invited to his hometown of Toronto in October 1997 by the Guild of Canadian Film Composers and the Society of Composers, Authors and Music Publishers of Canada. There was a tribute and party to him with musicians from across the country. He went to Ottawa where there were three concerts of his music at the National Arts Centre. He was commissioned then to write a major work for piano and orchestra. The result is his ‘Concerto for Piano and Orchestra – Cascades to the Sea’ (1998). His last works were a jazzy concerto for amplified bassoon, and a symphony first played in Edinburgh and dedicated to that city. A resurgence of interest in Light Music in the 1990s was accompanied by recognition of him as a major composers and he was finally acknowledged by his homeland: he was awarded the Order of Canada early in 1998. Also see: Robert Farnon’s filmography. David Quance began his professional writing career at Canadian Press in the 1950s. His extensive list of credits includes time spent as Executive Producer of all CBC National News programs; helping establish the news department at Global, and as a producer on W5, Canada AM and all news specials at CTV where he continues to work (while in retirement) as a political analyst in the network’s Election Unit.